Altec Lansing's inMotion Classic isn't short of features. 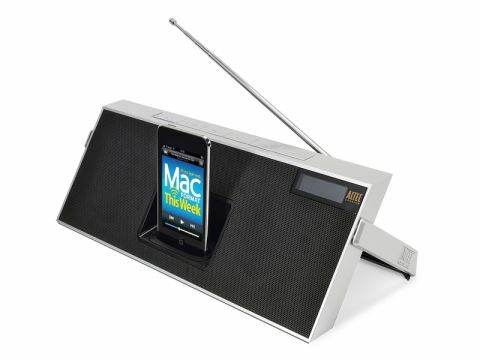 It's a speaker set for the iPod and iPhone, and also offers a built-in FM radio. It has a rechargeable battery for when mains power's not available; in our tests it lasted over five hours. An LCD shows which track or radio frequency you're listening to, and its auxiliary input means you can connect any audio device that has a headphone socket. Its sound quality is very good for a mobile speaker set. It doesn't match the standards set by expensive, high-end models, but it's loud enough to fill a decent-sized room without distorting and gives a surprisingly warm and complete sound considering its small form factor. There's lots of bass, plenty of definition and Altec Lansing's own Expanded Sound Stage technology makes the speakers seem further apart than they actually are. It's portable too, with its kickstand folding down when not in use or doubling as a handle for carrying your dock. Folding the stand into the 'closed' position turns off the device to save on precious battery power, which is a neat idea. There's even a built-in storage slot to hold the remote when not in use. The inMotion Classic is not without its faults. The hand controller feels cheap and insubstantial, with buttons that take far too much pressure to press. Its four radio presets aren't enough, and a clock with alarm functions would have been welcome. Even so, you're getting a lot of dock for your money.